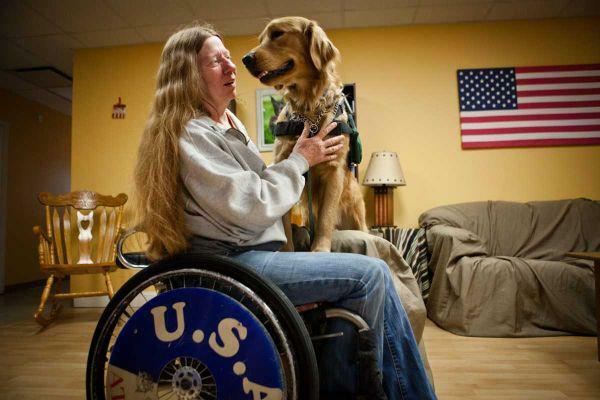 Jeanie Waters will have no trouble keeping up in the Rockville Centre St. Patrick's Day Parade because McGrew, her new golden retriever, will be there to pull her wheelchair. Waters, 53, a former auto mechanic, was born with muscular dystrophy and lost the ability to walk in 1984, after she fell and broke her neck. She had since obtained a law degree and practiced civil rights law on behalf of people with disabilities. She also won medals at three Paralympics events for wheelchair racing, taking gold in Barcelona in 1992. Twenty years later, even the indomitable Waters, of Rockville Centre, needs some help getting around and she loves the support of working dogs. "After six months, I couldn't live without her," said Waters of her old dog, who died recently. In the intervening period, during a slushy day, it took her an hour and a half to get around the block. "With a dog, I could have gotten through in five minutes," she said. Tugging the wheelchair will be just one of McGrew's jobs. He is also being trained to help Waters reposition her body on the bed, brace her when she needs support and bring her medicine. 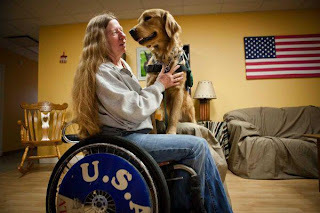 Dogs also can be trained to wake veterans from post-traumatic stress nightmares and watch over autistic children. Such versatility is one reason Waters chooses to use a dog-assisted manual wheelchair instead of a motorized one. Just like her first four-legged helpmate, Waters found McGrew at Educated Canines Assisting with Disabilities, a nonprofit dog training company, where she is now a board member. 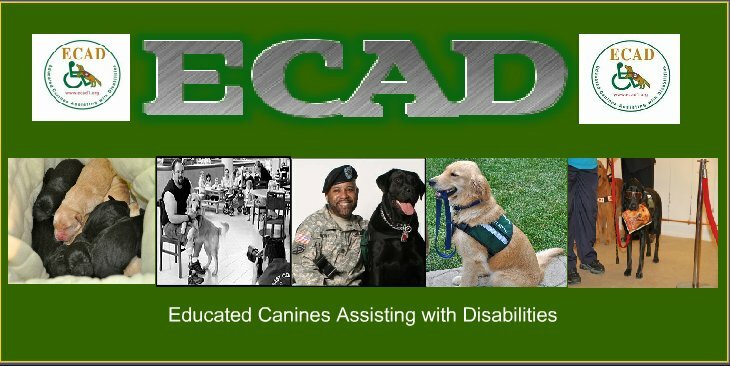 During the two-week program, she lives at ECAD's campus in Dobbs Ferry where the first step was to match her with a dog and train the dog to thoroughly understand her. Her first match, Louis, didn't take to pulling a wheelchair; McGrew took to the task. "We just fell in love with him," Waters said of herself and her father. The new companions will graduate from the program Wednesday. On March 24, many of them will be in Rockville Centre's St. Patrick's Day parade, which, for 16 years, has made a centerpiece out of raising money for three charities per year, each allowed to participate just once. Waters said that last year, each charity got about $23,000. This year, ECAD is one of the organizations to receive funds. The parade committee sponsored Waters' stay at ECAD, where she said Mayor Francis X. Murray of Rockville Centre called to wish her well. When she goes home, she has a job at the local CVS as a greeter until she can get her surgery next summer and perhaps return to practicing law on a regular basis. For now, Waters is excited to graduate with McGrew and is looking forward to this year's parade. "We're gonna have a float, we're gonna have veterans there and maybe some of the kids," she said. "And we raised over $700,000 in the past 16 years. We're gonna hit the $1 million mark soon."